Find some inspiration to follow your passion with these amazing TED talks. Even people that hate their jobs with a passion do not leave their jobs. These books speak to the potential that we all have inside of us to be our own boss. In the words of the BBC cult TV show - Why Don't You Just Switch Off Your Television Set And Go Out And Do Something Less Boring Instead! “It’s never been easier to start up your own business!” I’ve heard this countless times in the past few years from those that started businesses in the 80’s and 90’s and are now helping others to find their entrepreneurial spark. If so many people are unhappy with their job, why don’t more people quit their jobs and do what they love? What’s that recurring big dream that you keep pushing to the back of your mind. We’re often told that actions start with thoughts. But when it comes to starting a business, lots of people think about starting their own business and lots of them do absolutely nothing about it! A big part of Soup to Nuts is an online support system, so that it doesn't matter whether you live in London, Lanark, Llandudno or Londonderry. 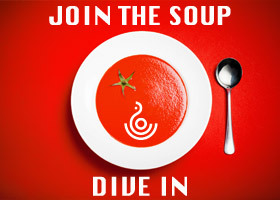 That meant we needed a soupy website where people could meet and merge minds. The idea for creating a support system for startups was dreamt up almost a year ago but the concept has been simmering for several years before that. There is plenty of advice out there to set up and run your own business, but after working with young creatives for a number of years it became clear that something just wasn't working. The word dream conjures up different ideas depending on the culture and language. Apart from the thing you might do while sleeping or staring out of the window, the dictionary defines it as a cherished aspiration, ambition, or ideal.